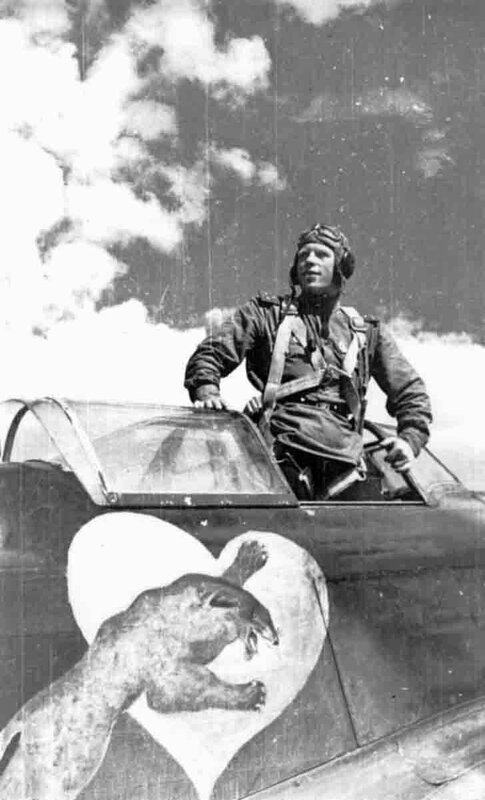 Future twice hero of the Soviet Union Lieutenant Alexei Alelyuhin in his Yak-1 fighter. Picture taken Fall 1942 – Spring 1943. On the fuselage of Yak-1 painted black panther – a brand name of Alexei Alelyuhin. Alexei V. Alelyuhin (1920-1990) – participant of the Great Patriotic War from its first day. June 24, 1941 as part of the first unit shot down enemy aircraft, bomber Heinkel He-111. Alex Alelyuhin made 183 sorties on the I-16, had 56 attacks to ground targets (risk of attack for a fighter). Alex Alelyuhin then flew fighter LaGG-3 and Yak-1 fighter, Bell P-39 Airacobra, La-7. The title of Hero of the Soviet Union Alexei Alelyuhin was awarded in August 24, 1943 for 265 combat missions and participated in 65 air battles, in which he personally shot down 11 enemy planes and 6 in the group. The second time the title was awarded Alexey Alelyuhin November 1, 1943 for 410 combat missions and participated in 114 air battles, in which he personally shot down 26 enemy aircraft. During the war Alexey Alelyuhin made 601 sorties, conducted 258 air battles personally destroyed 40 enemy planes and 17 more – in the group.